The stock exhaust was clearly not meant to be an enthusiast's system of choice. While television advertisements at the time showed a hemi roaring across the screen, buyers who actually drove the real car were often surprised by what they heard: Very little. 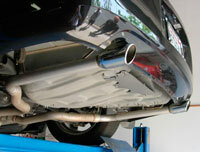 Simply put, the stock hemi exhaust is optimized neither for muscle car sound nor high performance. It was specially designed to be both quiet and even-toned, given that the gas-saving Multi Displacement System, which shuts off four cylinders to boost mileage, causes the engine to sound completely different out the back end unless clever steps are taken. Thats understandable once you get used to the idea. After all, they have to sell this car to people with all sorts of different tastes, and not everyone wants to hear a roaring engine. But the enthusiast wants to hear lions and tigers, as I did. And I wasn't alone. 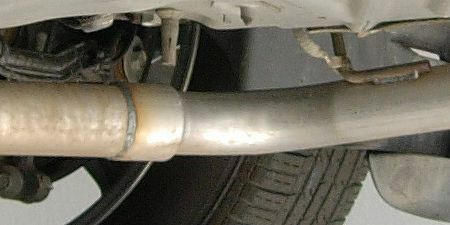 There are now dozens of aftermarket ''catback'' manufacturers (a catback is an exhaust system that replaces the stock tubing from behind the catalytic converters, thereby maintaining emissions legality). Thats how it is today, but back in the early days of this platform's release, there were very few, ridiculously expensive choices. I decided to wing it and see what I could cook up on my own. The morning after getting the car home, I went down to the local hot rod muffler shop. A shop very well known in the area and in its third generation of family-owner/operatorship. After getting under the car and looking things over, the decision was made to cut off the suitcase muffler -- a gigantic, 25+ pound behemoth that I was thrilled to get rid of -- and leave on the resonators. In place of the suitcase, two IMCO Pro mufflers were put in its place. 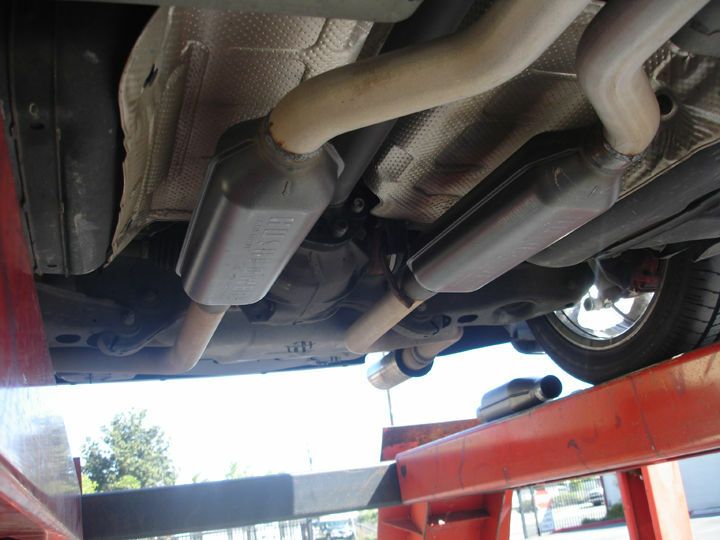 I had originally asked for Flowmaster 40 mufflers, but I was tiold that the IMCO units were longer-lasting, better (more solidly) made and gave a deeper tone that was less prone to droning. Seeing the IMCO's sitting next to a Flowmaster 40 I was inclined to agree. They appeared to be a much more solid product. 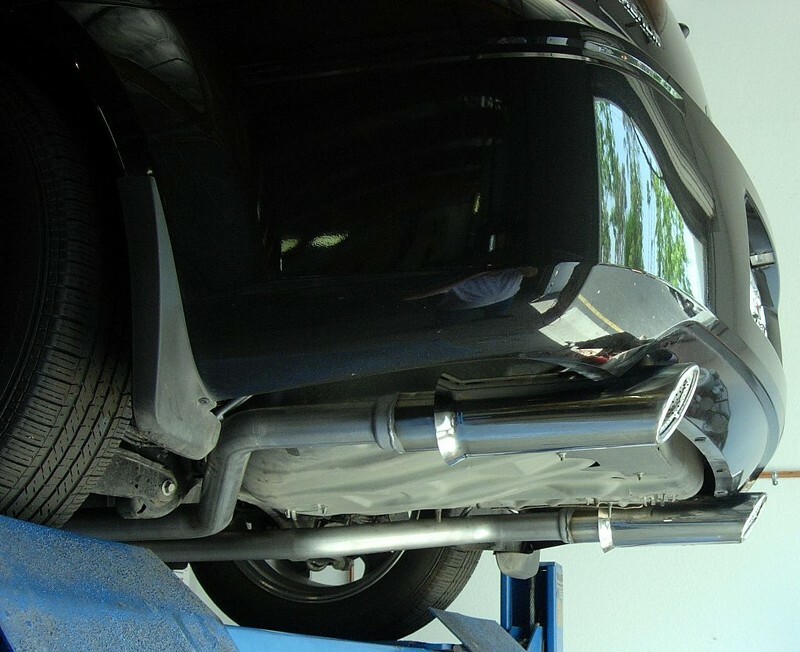 Installation at the shop was fairly straightforward, with the only noteworthy item being that one of the two pipes needed to be heated and warped outward a bit so that the two mufflers could sit apart from one another and not potentially rub together. Total cost for parts and installation was $265. Follow this link to a thread on the DodgeTalk community forum that shows the insides of the "suitcase" and "resonators" after they have been cut open with a torch. In terms of sound alone, I was well pleased. I had pretty much exactly what I had asked for: Startup sound was satisfyingly muscular. Cruising sound was quiet as a mouse. And if I stomped on the throttle I got a satisfying roar. In terms of performance, my 1/4 mile times showed a slight gain, so I did pick up a little, but not much. I was satisfied with this system for about four months. I decided just cutting the suitcase out of the picture wasn't good enough. 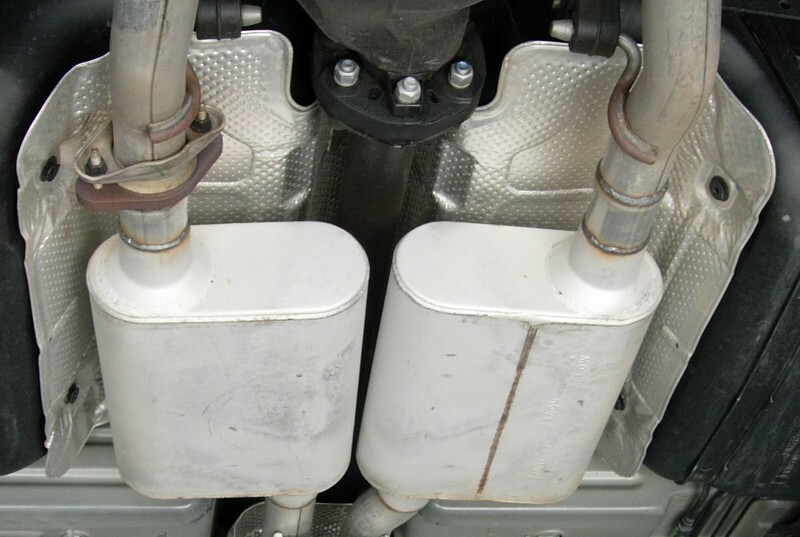 Those so-called resonators -- which are really mufflers when you cut them open and look inside -- were still on there, and they had a neck-down built into their inlets that reduced pipe diameter to 1.75''. They must die. I probably should have stayed happy after Step 1. Knowing what I know now, the right answer was to put some free-flowing resonators on. Either that or remove the resonators and put on a resonating tip. Or both. Live and learn. What wound up happening was this: I went back to the muffler shop, we hacked off the resonators and put some tips on. To replace the removed pipe sections, we used press-bent pipes at a reduced 2'' diameter. The idea was that we just lost a whole lot of backpressure to the system and we didn't want to open it up too much. There were already plenty of tales from others who had tried this and found that a simple cut-off was giving them problems with performance. Total cost for this modification was $110, bringing the total project cost to $375.00. I loved the sound before we even put the tips on. After the resonators were cut off, we brought the car down from the lift and started it up. The sound was *exactly* what you would expect from a 1960's or 1970's muscle car. A truly beastly, low burble. In terms of performance, 1/4 mile times stayed roughly the same -- and the temperature in early May was 20 degrees warmer than the 1/4 miles run in February. So here again I figured that I had not lost anything, and maybe gained some added performance. Drone is a harmonic resonance inside the cabin that occurs at certain points on the power curve when the sound emanating from your exhaust turns into a wave of undesirable sound. The air in the cabin seems to almost vibrate and you can almost feel it pressing your eardrums. Someone with sensitive hearing would be very uncomfortable. Its LOUD and not an "exhaust" kind of sound. It can be likened to the sound you would hear if you stuck your head inside of a tuba that is playing a continuous note. Driving around town, the car drew the kind of attention it deserved. Startups in parking lots drew head-jerks. Quite satisfying overall. Now for the bad news: I can't say I wasn't warned. Pretty much everyone who had gone straight pipe out the back of an LX had reported drone, and lots of it, in the 1800-2200 rpm range. At idle the car was a wonder but driving it was another story. I knew immediately what drone was (having heard it only described before) and that I had it. I will say that you do get used to it, and its not so bad after a few weeks of learning to live with it... but you had to learn to live with it. Driving around town I was able to minimize its effects -- and enjoy the sound of the exhaust -- by rolling all of the windows down. However thats not going to help much in the winter time. And if you've ever heard of the "wife test" rest assured this is one mod that will never pass it unless she's an extreme gearhead. So far my bill for exhaust work was low enough I could live with chucking it out the window. But this next step takes me over the edge. I had to get it right here or risk an aneurism when I have to try yet again. What to do? While I now know I could have taken the experiment at least one step further at minimal expense, at the time I decided to get it over with and quit playing around. I purchased a Zoomers catback system from Zoomers Exhaust. At the time, I was an early-adopter of a largely unknown brand, but since then Zoomers has become one of the leading providers of catbacks for the LX platform. One of the system's chief claims to fame is its almost completely free-flowing design that uses a few neat tricks of engineering to give great wide-open-throttle sound, a quiet cabin at cruise and no exhaust drone. Eventually, as the mods piled up, the exhaust got louder. Step by step until it was too much. It took a lot. That first 5.7L motor was putting out 360 rwhp by the time I pulled it out to make room for the 6.4. 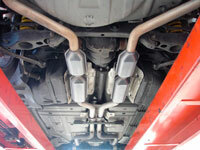 But the increased sound levels weren't what made me change the exhaust. Laguna Seca's infamous 92 db noise restriction limit is what did it. While I loved the sound of my souped-up motor, the sound meter didn't lie. I was at 102 db under conditions similar to passing the sound booth. 10 db is a LOT. So whether I liked it or not, the Zoomers had to go and that was that. I went back to my local hot rod exhaust shop for help. We looked around and they told me about a new kind of muffler from Flowmaster that was developed from a jet helicopter application they built for the military. It was marketed under the name Hushpower and purported to be a 21st century glass pack (without the glass inserts... its internal design is completely different). 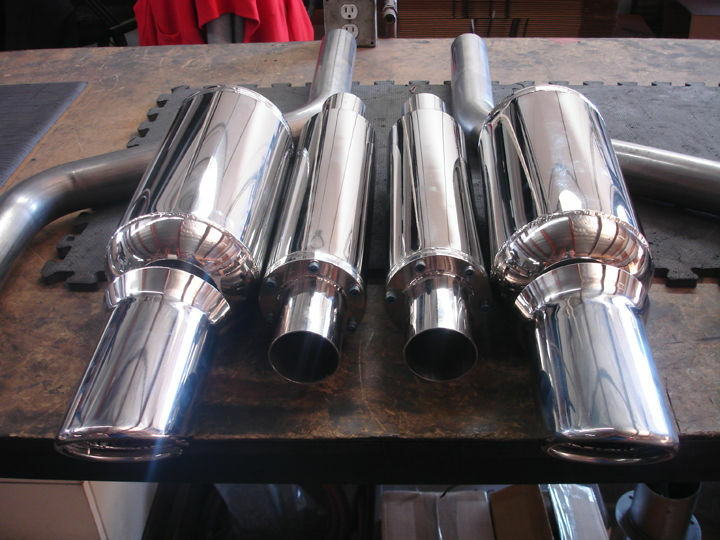 Good up to 450 hp and quieter than most of their applications, it seemed a good fit so he ordered a couple. 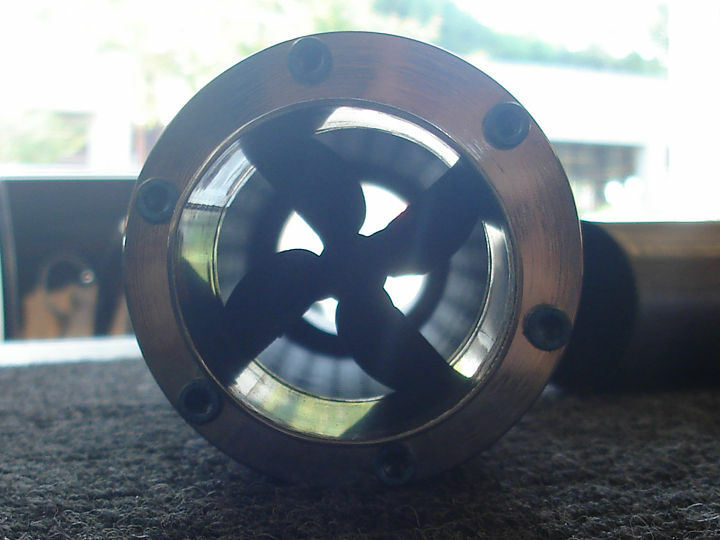 We re-used the mandrel-bent Zoomers pipes and kept the Zoomers tips. On install day, we cut off the poor beat-up Zoomers cans that had been on the car for years, put the Flows in their place and... the blasted car sounded exactly the same. In fact, there was now a vibration coming up thru the floorboards. Before we admitted failure I re-tested the sound... We were down to 100 db. So they were quieter, but not by much. Now what? Add resonators. 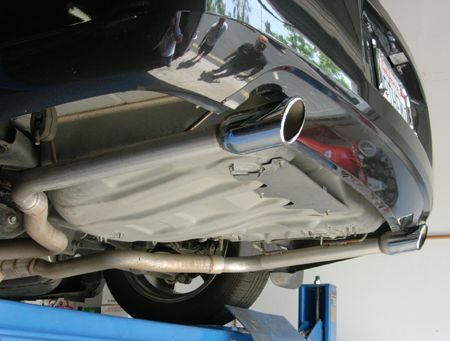 Flowmaster makes a resonator that is basically a shortie Hushpower muffler. So we ordered a couple of them. I didn't make the job any easier by absolutely insisting that any thought of removing the space-hogging Zoomers tips was a non-option. I had to really be firm on it because we had very, very little room to work with. 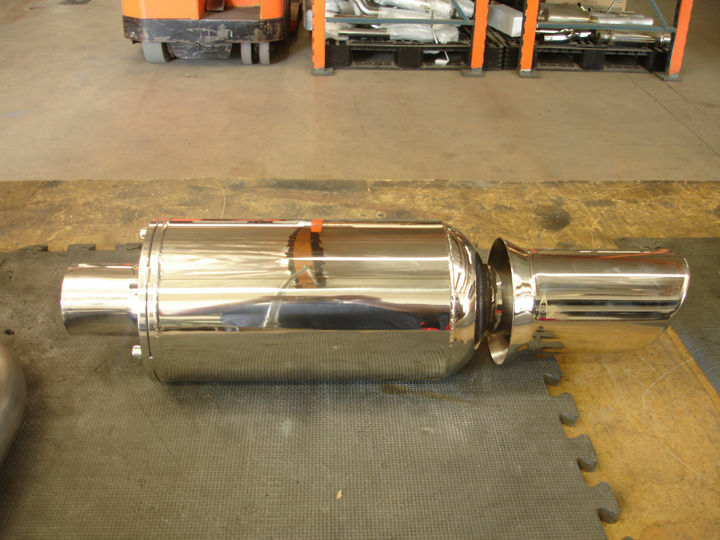 But the shop was very good at their job and able to fit the things in by cutting off the ends of the mufflers and welding them straight to the pipe. The result was a perfect fit... with very little room to spare. What I had in mind was a system developed specifically for higher-powered motors. The tried-and-true, two-can Zoomers setup didn't seem up to the task of taking on the bigger motors that were now beginning to enter the field, if my own experience was any indication. My idea was for a four-can system that moved the two big cans back to the rear of the car, where the resonators originally lived, and proposed using two of their thin 'silver bullet' cans up front. Since the cans in the rear would take up the space occupied by the rather large, special-function Zoomers cannon tips, a stubby version would be substituted that would be welded directly to the muffler. 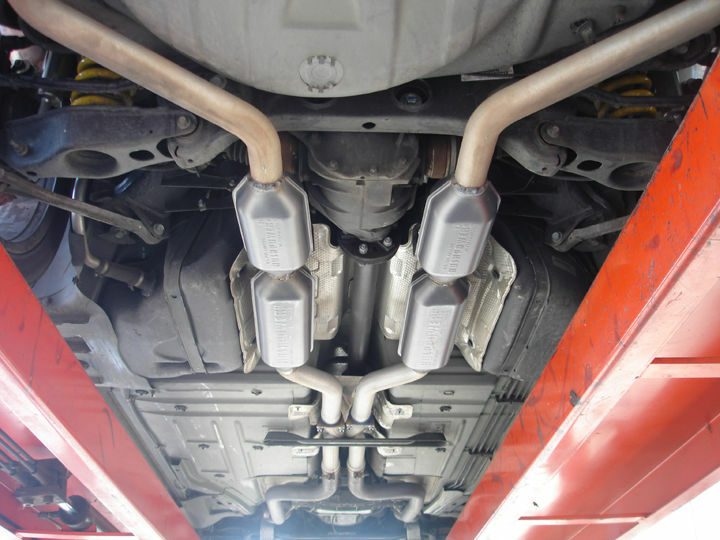 It would all run on 2.5'' (stock is 2.25'') pipe, which would match the pipe diameter of the midpipes that the catback bolted up to -- since the Zoomers system is so free-flowing, we didn't need to go to the crowd-favorite popular 3'' pipe size. 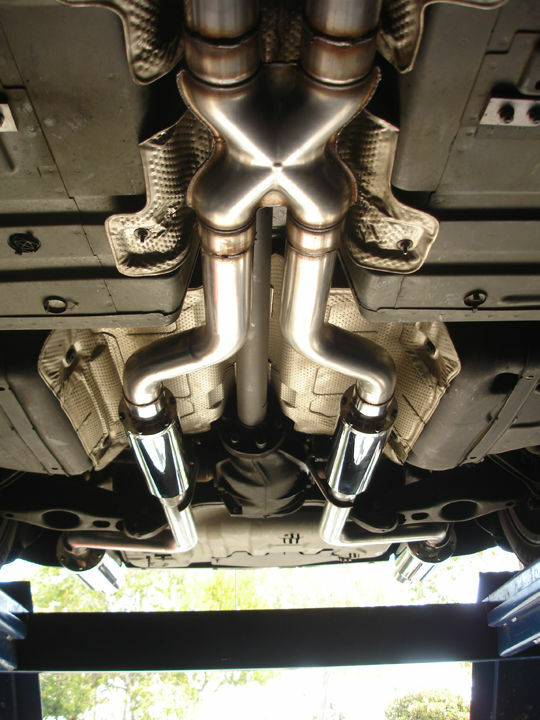 The hope was that, while others who run Laguna Seca go through all sorts of painful modifications and restrictive gymnastics to get their exhausts to pass sound at Laguna Seca, I would have a fully free-flowing, performance system that would pass sound without modification. So what happened when I got it onto the road? Did my evil plan succeed? Yes it most certainly did. I had a great sound that got meaner as revs increased... but not really louder. And when I say meaner... I mean Werewolf-mean. The sound was stunning. On a race track where everyone is hobbling themselves with goofy exhaust mods that reduce performance, I would be running with a performance system. It was perfect. Except for one thing. The damn thing droned. 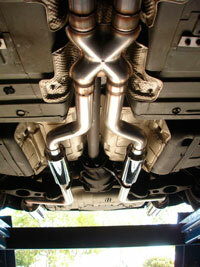 This is why you don't just sign off the internet and become an exhaust system designer. Talking to Zoomers, they had seen the problem before on Corvettes. The best solution was a sidecar resonator. We mounted them in the rear, just in front of the big cans, but up high so you would never know they were there unless you crawl under and look. The sidecars did a great job, reducing the resonance by about 50%. The remainder is comfortably livable, for a performance car. Chugging around town between 1500-2000 rpms its still a bit annoying, but an upshift or downshift fixes the problem.